What i'm curious about though is whether they build up into decent guitars in their own right? Or are they a fun project that you ultimately sell on? Would i be better off saving for another year and getting one of the cheaper Godin 5th Avenues or similar? Any thoughts from previous owners? I have a few of their kits that are in the process of being assembled and I've been on their forum for 19 months or so. I suggest looking around on the forum, both at the current build diaries and probably at the Guitar of the Month section as well, where you'll get a good overall picture of what can be achieved. They aren't something that you'd sell on, certainly not for a profit. They are partly the thrill of the journey, and partly the destination. Some people have made really good guitars from the kits, some have made very average or poor ones. But you can get a very good looking and great playing guitar at the end. To do it well, you'll probably end up spending more than you'd spend on say an Epiphone equivalent, but then you've created it yourself. The kit hardware is basic low-cost Chinese fare. Adequate tuners and bridges, undistinguished pickups, cheap pots and wire. The bodies and necks are reasonable. They come from three different factories that make complete guitars, and a recent new one that only makes kits, but to a higher standard. The newer Strat and Tele kits have 2 piece bodies, with wood that matches, whereas a lot of the other solid body kits are 3 or 4 piece bodies with generally non-matching grain patterns that are best (IMO) painted a solid colour. There have been a few ES-5V builds in recent months, and they've all come out pretty well. The basswood ply bodies are well made for what they are, with a fairly pretty outer layer that I still think is probably birch. The bodies are certainly lighter than say a Gibson equivalent - the ES 335-style kit is about half the weight of a real 335. 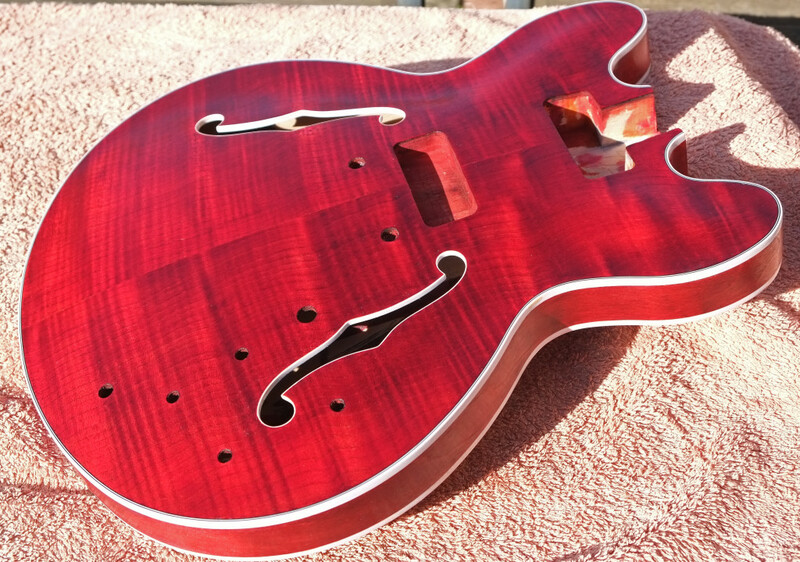 Surprisingly the factories don't use CNC machines, but rout out from templates (which can lead to the occasional errors with wrongly located holes), and there are a few kits that always need a bit of work on the neck angles (the Ric bass style kits). They are certainly not just kits that you can stick or bolt together and come out with a good looking, great playing guitar. They all need a decent amount of work on, some you need to correct small errors, and all benefit from a proper fret levelling and reprofiling, so it helps by having a certain number of specialist luthier tools. You'll be hit for around 23% of the price for VAT and duty when the kit arrives, plus the PO handling charge. I'd suggest a stained body (rather than sprayed) and finished with Tru-Oil. Spraying can work well (I started with spray cans then bought a compressor and mini-spray gun) but you need good warm dry weather and somewhere to work outside the house to get a good finish, whilst staining and rubbing on Tru-Oil coats can be done inside. Tru-Oil was designed for use on gunstocks, and is a linseed oil based product containing a resin which hardens (a bit like shellac), so dries like a varnish (and it's not oily when dry). Here's my custom ES-1 kit body (customised for an ES-330 style build) a few weeks back. Since then I've been adding more coats of Tru-Oil but have mainly been working on a headstock inlay, which has slowed me down a lot as my attempts haven't worked well. I think I have a working solution, but have run out of suitable inlay material (and Rothco and Frost, another decent luthier supplier, have let all their stock of decent sized inlay materials dwindle to almost nothing at the moment). It's a great forum at Pitbull, everyone is nice and helpful, and if there is a problem with the kit, Adam, the owner, is very good at getting things replaced if necessary. If you decide to buy a kit, I highly recommend joining the forum and starting a build diary, and just keep asking questions, preferably before rather than after you try something you're not sure about. There are quite a few UK builders at the moment, and quite a few European ones too (plus some US and Canadian kit builders). Apart from a few Aussie terms like 'Metho' instead of 'Meths' and most of the measurements used being in mm and cm than feet and inches, there's nothing else to get used to. I'm around on there most days. Thank you for such a detailed reply Wonks, add another pint to the list of ones owed. Plenty to think about there. I've built a cheap electric kit before (but because i'm an awkward sod i built an amp into it as well) so i don't mind putting time and effort in - I just want to make sure it's got the potential to be something i'm going to enjoy playing at the end of it. P.s. that red body looks lovely! Thanks. It actually looks a bit browner indoors, especially now it's got a few more coats of Tru-Oil on. If you want a sunburst finish, then spraying is the best way to achieve it. 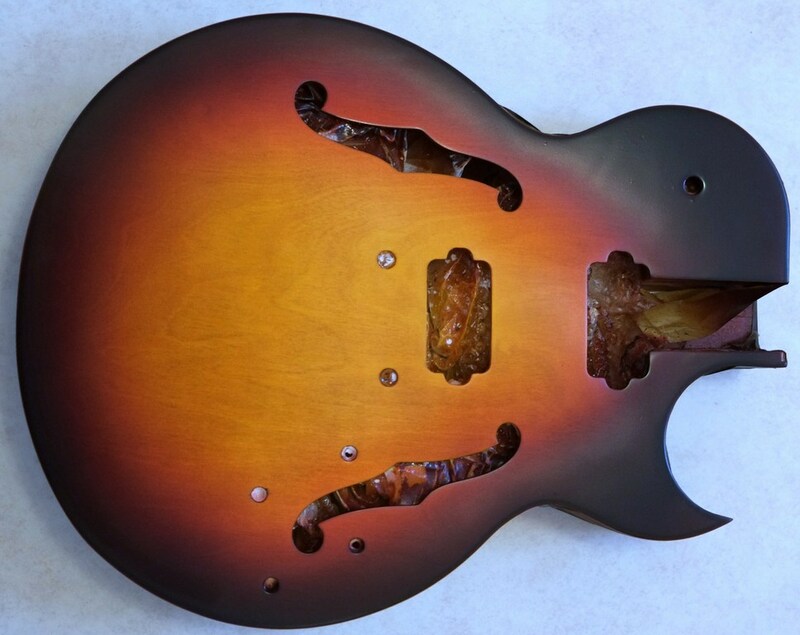 Here's what my my ES-3 kit body (an ES 175 style kit) looked like after spraying with nitrocellulose paints. Unfortunately i then left it too long before scraping back the binding, which meant the finish was very hard and it wasn't just one easy scrape with a blade as you see in the videos, but many hours work scraping off a bit at a time. And then the weather turned too cold to spray any more, so I never did the clear coats. Over the winter the body was stored by a radiator and then all the nitro puckered into ridges, By the time I'd flattened the surface, there were lines of the undercolours showing through, so I had to strip the finish off and am now waiting for some decent warm weather so I can respray it. This time I'll mask the binding as it's a lot less work. 3M 3mm and 6mm fine lining vinyl tape is useful for this. I favour natural wood finishes so I'd just be going with a few coats of clear tru-oil. Which is convenient as I really don't have a decent place to do any spray-painting. Hope you go for it BD, and post some pics as you go? It will actually be the third time round, as I overdid the tobacco spray round the edge the first time. The tobacco darkens a lot when it dries and what looked OK when wet suddenly resulted in a very small light area in the middle when it was dry. So that got stripped back and the body re-sprayed. So the photo is of the Mk2. If I'd got it right the first time. I'd have got the binding scraped before everything dried too hard and the clear coats on before the weather turned too cold to spray and I'd be showing pictures of a finished guitar. Wonks wrote: I have a few of their kits that are in the process of being assembled and I've been on their forum for 19 months or so. I suggest looking around on the forum, both at the current build diaries and probably at the Guitar of the Month section as well, where you'll get a good overall picture of what can be achieved. I just had to register my admiration of your sunburst and cherry finishes. They look stunning. (and sometimes wood) acquired at bargain basement prices. I can vouch for the pleasure that comes from playing something that's unique to yourself. Very much so, Adrian. And thanks, John, appreciated. I'll bet it was ! I assume the guitar can be played through an amp as well ? But that's a good sound - and fun too. Yep, the little switch between the two guitar knobs flicks between the built in amp and a normal jack output. Imgur seems to be the best image hosting place now. Google pictures does work but it's a surprisingly complicated process to get a shareable link (in my opinion). Dispatched today. Never ordered anything like this from overseas before - what happens with the customs? Presumably it gets held and I get a letter with a bill in it? Or is it more advanced than that nowadays? blinddrew wrote: Imgur seems to be the best image hosting place now. Google pictures does work but it's a surprisingly complicated process to get a shareable link (in my opinion). The acoustic and the Thinline were built from scratch and the other three from parts mostly. As you can see, I like Teles but I've tried some variations on the theme. I don't think any of them would have given Leo any sleepless nights. It's my first acquaintance with Imgur, so I hope the links work. Pictures work fine, some nice variations on a theme there! blinddrew wrote: Pictures work fine, some nice variations on a theme there! Thanks Drew. At least they all work and sound OK. The kits normally take 5 days or so to reach the UK, then take 7-8 days for customs clearance. The tracking will at that point say 'delivery attempted', which basically means the PO now has it and has sent out a note saying that VAT and duty + PO handling charge need paying. You can either go to the sorting office, pay there and take the kit away with you, or pay it via the web, and they'll deliver it on a day of your choosing (normally minimum 2 days later) so you can arrange for someone to be in to accept it, as it needs a signature. Nice work, John. Did you build the Tele necks yourself as well, or buy them in? Wonks wrote: Nice work, John. Did you build the Tele necks yourself as well, or buy them in? I made the thinline neck and one of the other Tele necks and the acoustic was completely from scratch (my wife bought me a course on acoustic building as a retirement present. It was run by Alan Marshall, who makes Northworthy guitars). In total, I have made five necks from scratch.